The Church has celebrated Mary's birth since at least the sixth century. A September birth was chosen because the Eastern Church begins its Church year with September. The September 8 date helped determine the date for the feast of the Immaculate Conception on December 8 (nine months earlier). Scripture does not give an account of Mary's birth. However, the apocryphal Protoevangelium of James fills in the gap. This work has no historical value, but it does reflect the development of Christian piety. According to this account, Anna and Joachim are infertile but pray for a child. They receive the promise of a child that will advance God's plan of salvation for the world. Such a story (like many biblical counterparts) stresses the special presence of God in Mary's life from the beginning. St. Augustine (August 28) connects Mary's birth with Jesus' saving work. He tells the earth to rejoice and shine forth in the light of her birth. "She is the flower of the field from whom bloomed the precious lily of the valley. Through her birth the nature inherited from our first parents is changed." The opening prayer at Mass speaks of the birth of Mary's Son as the dawn of our salvation and asks for an increase of peace. We can see every human birth as a call for new hope in the world. The love of two human beings has joined with God in his creative work. The loving parents have shown hope in a world filled with travail. The new child has the potential to be a channel of God's love and peace to the world. This is all true in a magnificent way in Mary. If Jesus is the perfect expression of God's love, Mary is the foreshadowing of that love. If Jesus has brought the fullness of salvation, Mary is its dawning. Birthday celebrations bring happiness to the celebrant as well as to family and friends. Next to the birth of Jesus, Mary's birth offers the greatest possible happiness to the world. Each time we celebrate her birth we can confidently hope for an increase of peace in our hearts and in the world at large. 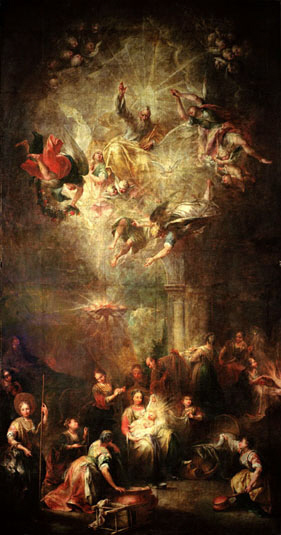 "Today the barren Anna claps her hands for joy, the earth radiates with light, kings sing their happiness, priests enjoy every blessing, the entire universe rejoices, for she who is queen and the Father's immaculate bride buds forth from the stem of Jesse" (adapted from Byzantine Daily Worship). When we hear from today's gospel the genealogy of Jesus, we appreciate anew the great preparation that Heavenly Father took to bring to birth Blessed Mother. To us she is a humble and unknown teenager in an insignificant town who said 'yes' to seemingly impossible request from Archangel Gabriel. The long line of genealogy that goes back to the time of Abraham shows us the dignity of Blessed Mother's heritage. The other day I was hearing confession of a teenage girl, and she was so distraught because she felt she was so worthless, insignificant, and alone. I had to remind her what great preparation that God the Father took to bring her to birth. I reminded her that she had a great mission on this earth; she is to make God's love, flesh. That's what Blessed Mother did when she said 'yes' to Incarnation. The Love of God was made flesh! Today's feast day reminds us that we too need to bring Jesus to those we meet.